Spacious room with a special touch, decorated in warm colours. Featured wall uniquely decorated with natural materials.Private wooden deck with views, King size beds or twin beds, en-suite bathroom bath & shower, TV & DStv/ Fire place. Spacious room decorated in a grey tone & featuring an astonishing stone frame wall. King size/Twin beds, en-suite bathroom decorated in a very elegant style. Outside decking with wonderful views. 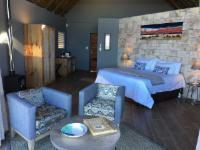 Safe, coffee facilities, mini bar, TV & DStv/Fire place. From this spacious Safari Tent, you have an unbelievable view of the bush & the Indian Ocean. Perfectly decorated with a colonial style & colour scheme. Very Stylish and Perfect for HonneyMooners, with the King size bed. En-suite antique bathroom. The owner's talents in woodwork bring a very special artistic touch to this Luxury Safari tent, with a featured wall made of different woods & colours. From this spacious, beautifully decorated tent, you have an unbelievable view of the bush & the ocean. The Leopard Luxury Family Suite, offers the upmost Zebra Lodge can offer, on a unique African contemporary style. Enjoy the view over the Indian ocean and Jeffreys Bay through the large windows while relaxing on the sofa. All amenities available. wifi . If cancelling 7 days before arrival, forfeit 100% of the booking total. If cancelling 14 days before arrival, forfeit 90% of the booking total. If cancelling 30 days before arrival, forfeit 75% of the booking total. If cancelling 999 days before arrival, forfeit 50% of the deposit.